I am a great big old Sondheim sap. I admit this. I saw the original production of this particular musical in 1973 a month after it opened — as a callow youth on her first theatre trip to New York City from western Michigan. I had the score memorized by the time I was 15. I have seen other productions, including the lovely and literal and musically moving production that was part of the Kennedy Center Sondheim Celebration summer 2002. (For a retrospective visit to that summer’s offerings: http://tinyurl.com/2fxx2nx.) I attended the final performance of the show, which was the final performance of that summer’s celebrations, which included a final bow with all the production staff of all the summer’s shows, culminating with a surprise appearance of Mr. Sondheim himself, bringing the crowd to a riotous level of applause, bravos, adulation. I say all this to suggest: I understand a bit about an appreciative audience, and a Sondheim appreciative audience, and in fact spend much time in appreciative audiences that have nothing at all to do with musical theatre. And this A Little Night Music, the revival replacement cast with Bernadette Peters and Elaine Stritch and a solid ensemble, is one of the most amazing evenings I have ever spent in the theatre. I could edge up to talking about the wonders of this production. The spare set by David Farley of revolving framed panels that act as mirrors, as the inside of a theatre, as walls with rear-projected hung pictures and other detritus, as the second act forest of birch trees, as frames. The beautiful costumes by this same designer entrance the eye. Lighting by Hartley T A Kemp augments but does not overwhelm the performances. And yet, and still, and gloriously: this production is about the direction by Trevor Nunn and the performances. 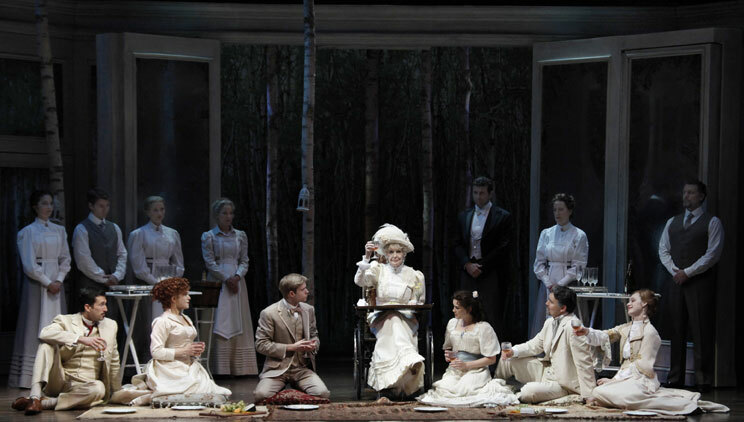 A streamlined chorus / ensemble provides group adventures, weaving in and out of the story of Swedish summer nights at the turn of the last century sorting out their relationships and finding love and meaning among friends and family. 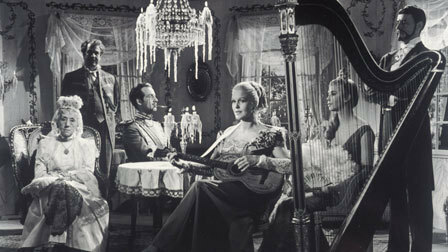 Some plot: Recall that this whole adventure is based on Ingmar Bergman’s 1955 movie Smiles of a Summer Night (http://www.criterion.com/films/849-smiles-of-a-summer-night). Our action involves a few nights “in town” and a country weekend at the Swedish estate of aging courtesan Madame Armfeldt (Elaine Stritch) whose never-married actress daughter Desiree (Bernadette Peters) tours in shows and performances, collects accolades, yet is perhaps tired of this relentless restlessness. Desiree reveals her torpor in her first sardonic words in her first sardonic song delivered as a letter to her teenaged daughter Frederika (Katherine McNamara the performance I attended) — “The Glamorous Life”. We know early in the story that this glamorous creature, who lives life a little untidily, is more than ready to settle down. Old love Frederick (Alexander Hanson) visits a performance by Desiree one evening with his new young second wife Anne (Ramona Mallory) who is the same age as Frederick’s son Henrick (Hunter Ryan Herdlicka). Desiree and Frederick meet again, rekindle, and she schemes a plan to get Frederick back. Desiree’s current married lover Count Carl-Magnus (Bradley Dean the evening I attended) lurks around, flashes his sword, threatens to duel, invites himself to the weekend house party, while his understanding wife Charlotte (Erin Davie) waits and emotes and articulates with Anne in a scene that has always reminded me of Emilia and Desdemona in Othello contemplating the idiocy of men and the women who love them — “Every Day a Little Death”. There are servants, including the self-knowing and powerful and attractive and riveting Petra (Leigh Ann Larkin), maid to young Anne, who exudes consistent fun and self-awareness proclaiming, even with her dreams and adventures, that “I shall marry the miller’s son”. So to my mind this production is stunning even without the history making performance of Peters as Desiree, a role that uses little of the power of her singing voice (written as it was for an actress with a very small range) yet all of her acting skills. She finds nuances to “Send in the Clowns” that this fan of that song and this oeuvre has never heard, seen, or felt before. And Stritch — let us contemplate the wonders of the finely honed tragicomic timing of Elaine Stritch in this role of a mother and grandmother who has lived and loved and lost and knows the pain and joys of living life to the fullest yet according to social rules. Let us marvel and let us feel and let us applaud. Yes. The spare interpretation of this essentially straightforward story of a set of extended family members contemplating meaning and relationships and the smiles of a summer night. I hope to return. I gasp with the memories. And this is probably one of the least dispassionate reviews I shall ever write. And yet, I was there. You should be there too, as soon as possible.